The research team was able to classify neurons based on chemical modifications in their DNA. Pictured here are clusters of different kinds of “stop” and “go” neurons in the human frontal cortex. Image by Jamie Simon, Salk Institute. There are about 100 billion neurons in an adult human brain. We’ve long known they don’t all look the same. We also know they don’t behave the same. But we’re still trying to find out just how many different types of neurons there are and what they do. To be able to do this at scale, scientists are turning to molecular methods. Now, a team from the Salk Institute for Biological Studies and the University of California San Diego has, for the first time, profiled chemical modifications in the DNA of individual neurons, giving the most detailed information yet on what makes one brain cell different from its neighbor. Published in Science, the study analyzed a neuron’s methylome, or pattern of methylated DNA. DNA methylation is chemical addition of methyl groups to the bases in a DNA molecule, which alters how genes are expressed without changing their sequence. These are epigenetic changes, and cataloging them, in a total of about 6,000 cells or 1 trillion DNA bases, enabled the team to sort the neurons into subtypes and create new kinds of brain maps based on a neuron’s gene expression. The study also identifies new subtypes of neurons. The paper’s senior co-authors are Joseph Ecker, director of Salk’s Genomic Analysis Laboratory and an investigator of the Howard Hughes Medical Institute, Margarita Behrens, senior staff scientist at Salk, and Eran Mukamel of the UC San Diego Department of Cognitive Science. The first authors are Chongyuan Luo, a Salk research associate, and Christopher Keown, a cognitive science graduate student at UC San Diego. The co-authors believe their paper makes important advances both in molecular biology and in computation. Earlier single-cell methods have focused on analysis of RNA. But levels of RNA can change with conditions, while methylomes are generally stable throughout adulthood. Methylomes, the researchers hypothesize, offer a more precise way to identify neurons. The team studied neurons in both a mouse and a human. They used a single-cell methylome sequencing method they’d recently developed, applying it to 3,377 neurons from the frontal cortex of a young adult mouse and 2,784 from the frontal cortex of a deceased human male aged 25. Unlike other cells in the body, neurons have two types of methylation, so the team’s approach mapped both types. 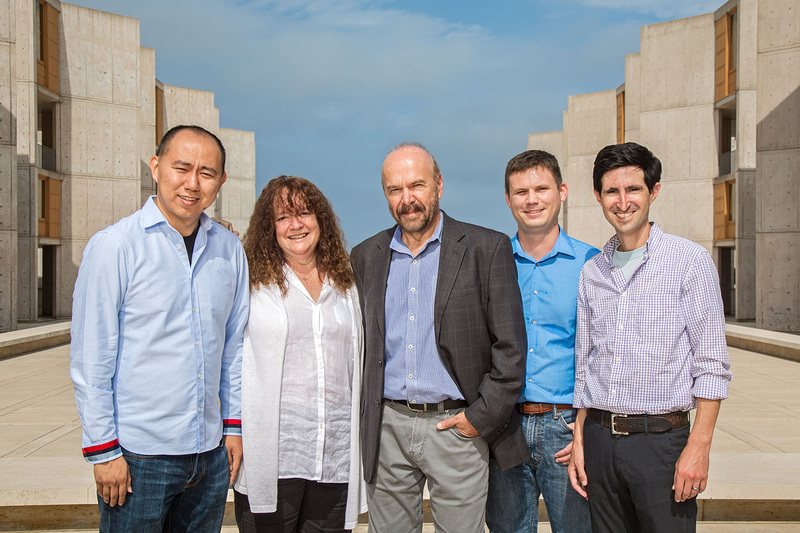 From left: Chongyuan Luo, Margarita Behrens and Joseph Ecker of the Salk Institute, Christopher Keown and Eran Mukamel of UC San Diego. Photo by Salk Institute. Neurons from the mouse frontal cortex, they found, clustered into 16 subtypes based on methylation patterns, while neurons from the human frontal cortex were more diverse and formed 21 subtypes. 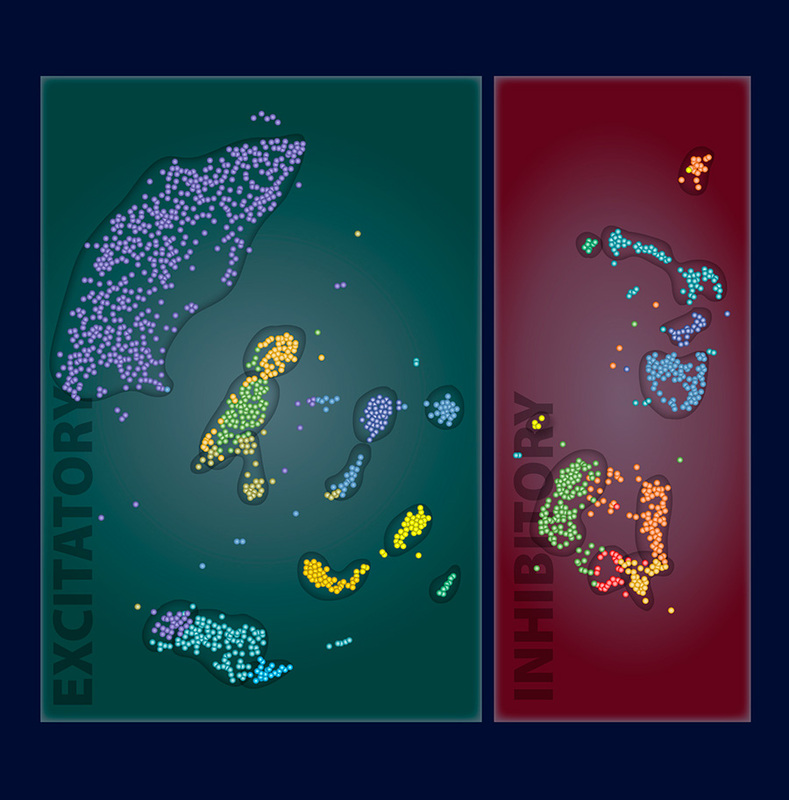 The methylation patterns of inhibitory neurons – those that provide the brain’s “stop” signals – were more alike between mice and humans than those of the excitatory (or “go”) neurons. This suggests greater evolutionary conservation of inhibitory neurons and might be a clue to their importance. The study also defines new subtypes of human neurons. The team’s results add to the “brain atlas in an objective, data-driven way,” said Mukamel, who is also an affiliate of the Kavli Institute for Brain and Mind at UC San Diego, as well as the university’s neurosciences program. And that could lead to better understanding not only of the differences between the brains of humans and other animals but also to better understanding of brain development and dysfunction. The current research follows an earlier paper published in Science, led by Behrens and Ecker with Mukamel as one of the first authors, on epigenetic changes in the developing brain. Next steps for the work include studying more mice and more humans, as well as comparing methylomes in the brain cells of healthy individuals to those suffering from brain diseases. The co-authors explain that their approach allows them to see differences in neurons that were invisible before. Other researchers on the current study were Jingtian Zhou, Yupeng He, Rosa Castanon, Jacinta Lucero, Joseph Nery, Justin Sandoval, Brian Bui, and Terrence Sejnowski of the Salk Institute; Junhao Li of UC San Diego; and Laurie Kurihara and Timothy Harkins of Swift Biosciences Inc. The work and the researchers involved were supported by grants from the NIH BRAIN Initiative (5U01MH105985 and 1R21MH112161), the Howard Hughes Medical Institute, and the National Institutes of Health (2T32MH020002). More information in Science (“Single-cell methylomes identify neuronal subtypes and regulatory elements in mammalian cortex,” DOI: 10.1126/science.aan3351) and on the project website, http://brainome.org.